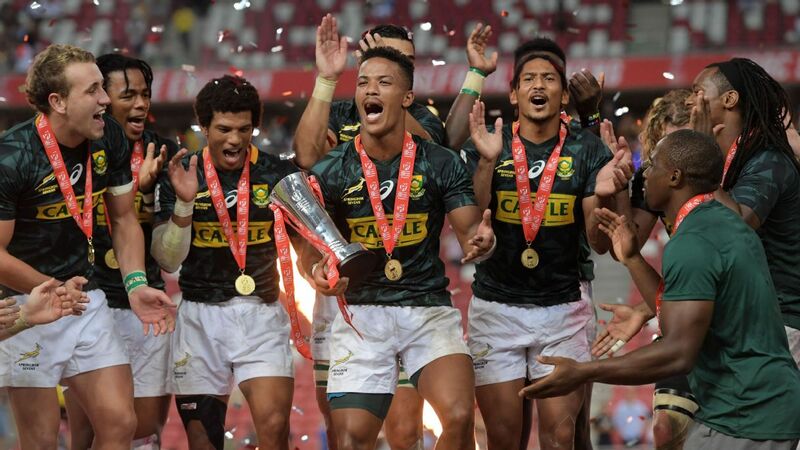 Branco du Preez has played in more matches for South Africa’s Sevens team than any other player, but the Blitzboks playmaker experienced a completely new feeling in winning the HSBC World Rugby Singapore Sevens on Sunday. Du Preez, who tied the all-time appearance record for South Africa in the HSBC World Rugby Sevens Series on Saturday, with Kyle Brown (69 tournaments), thought he had seen it all in his nine years with the Blitzboks. But the feeling he experienced after South Africa overhauled Fiji to win the Singapore Sevens cup final 20-19 — having trailed 19-0 at halftime — was beyond description. “The moment feels unreal, to be honest,” Du Preez said after the final, his 350th match, three more than Brown. Oosthuizen, who scored the third try in the comeback, said he was “very proud” about the “awesome” performance. “I will always remember this match and the way we fought back,” Oosthuizen said. Justin Geduld, who passed Fabian Juries and moved into the third spot for Blitzboks’ career points scored in the Sevens Series, said the younger players deserved praise. “They really kept going,” Geduld said. “We lost our captain, Siviwe Soyizwapi, and leading try-scorer in Singapore before the final, and Angelo Davids, in only his second tournament stepped up and played very well. “I told the guys to keep believing in our processes,” Geduld said.